According to Vedic Astrology, benefic or malefic planets show their results amidst Mahadasha, Antardasha and transit. The results given by the planets depend on the quality and strength of planets placed in one’s horoscope. If a planet is powerless in the chart, the results related to that planet or house will also be correspondingly weak despite the fact that that planet might be strong during transit. This is where the importance of Gemstones lie. Wearing a gemstone of the planet that is weak in your chart makes it stronger and you are also blessed with the powers and positive aspects of that planet, as well. 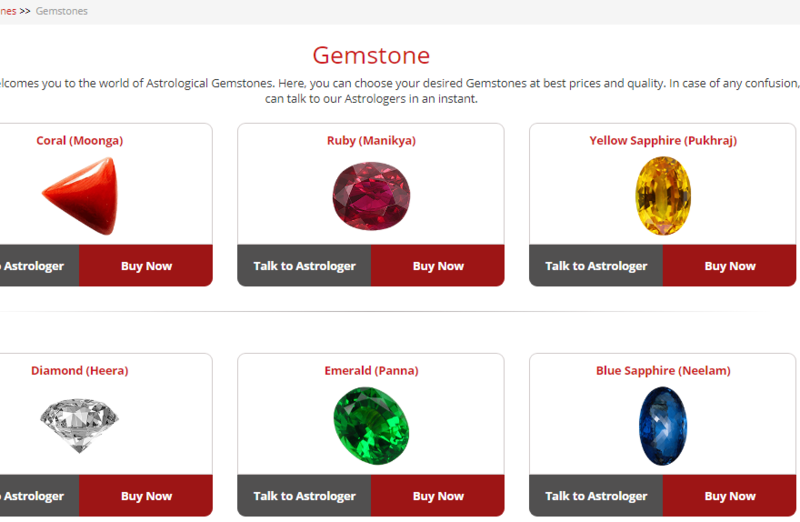 Besides this, gemstones are viewed as a powerful tool in Astrology which has the power to give energy to the powerless/weak planets which are advantageous in the horoscopes. Every planet has its own gemstone according to the color and the depending upon the capacity of the gem to pull in the cosmic rays of that specific planet in it. In ancient times, gems were so popular that the kings used to wear them as rings and adorn them even in their crowns as they are believed to bring wealth and success apart from protecting one from the malefic planets. Gems possess a distinct allure and brilliance. These gemstones are cut finely by experienced gem specialists. In Ayurveda, gems are given special significance as they are generally used to treat certain illnesses. Interestingly sometimes ash of certain specific gems is used as a part of Ayurveda to cure even some serious diseases. Gemstones have mystical, optical, healing and cosmic properties effective to strengthen the weak planets in one’s horoscope. Gems are energized with special mantras before wearing to give maximum benefits to the wearer. Garnet is the birthstone of people born in the month of January. It is a beautiful red colored gemstone and is also associated with Aquarius zodiac sign. Amethyst is the lucky stone for people born in February. It is a splendid violet colored gemstone which has meditative and calming properties. Bloodstone is the gem for people born in March. Bloodstone is green in color with red spots. It is mostly found in Cabochon cut. Red spots were believed to be the blood of Jesus and this stone is believed to have miraculous powers. Diamond is the most precious gem found on the Earth. People born in April are suggested to wear diamond. This beauteous gem is supposed to heal and also signifies love and eternity. People born in May should wear Emerald for luck and prosperity. Many around the world love this intense green colored gem. It is also associated with prophetic planet Budha or Mercury. Pearl symbolizes chastity and modesty. People born in June should wear Pearl. Pearl is considered as a benefit stone which can be worn by an individual with a weak Moon. Ruby has the power to bring harmony in the life of the wearer. People born in July are suggested to wear Ruby. Ruby is the stone of the ruling planet, Sun. People born in August should wear Peridot. It protects one from evils, particularly from the forces of darkness. It also possesses healing powers. Peridot comes in many beautiful shades of green. Sapphire is the gemstone for those born in September. Sapphire is the precious gem available in a range of all colours, but, blue sapphire is the most popular type of this gem. Sapphire has medical as well as spiritual healing properties. For those who are born in October, Opal is their traditional birthstone. Opal comes in many different varieties and is a rare gem. This is why, it is one of the most famous gemstones in the world. Citrine is a semi-precious gemstone belonging to the Quartz family. People born in November should wear this stone, but after consulting an Astrologer. Citrine makes it wearer more independent, humorous and full of enthusiasm. The birthstone for December, Tanzanite is an extraordinary gemstone as it has a highly unique blue colour which is different than the colours of all the other blue crystals. It allows the wearer to be more expressive and gives them the ability to push their limits and seek one’s true purpose in life.